Vroom, vroom! 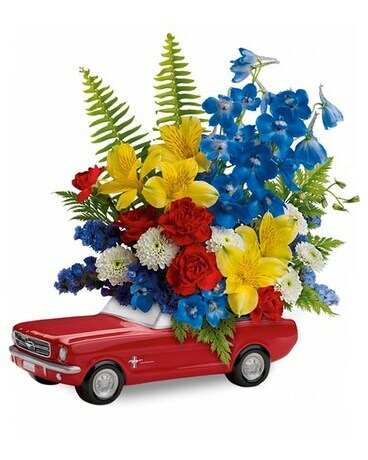 Get their motor running with a freewheelin' gift they'll never forget - a bold bouquet of alstroemeria, carnations and mums, hand-delivered in a '65 Ford Mustang convertible keepsake. Hand-painted in classic poppy red, this ceramic collectible is one-of-a-kind, just like they are. This is a one-sided design. Exact flowers and colors may vary slightly based on daily flower availability.